The mad Swiss at Rinspeed, known for both Porsche tuning and underwater Lotus tuning have set their sights on the Porsche 957 Cayenne and the results are extreme X-treme. The Rinspeed X-treme is much wider and lower than the stock Cayenne thanks to the bulging arches and matching side skirts. The whole package is also lower thanks to an electric air suspension that lets the driver adjust the car by 35 mm. More power comes courtesy of a new sport exhaust system that brings the X-treme up to 600 hp. Press release below the jump. The Swiss company Rinspeed, also renown as a noble Porsche tuner, can look back to thirty years of tradition and now presents its latest customizing program based on the face-lifted Porsche Cayenne. The latest creation of the Swiss is called X-treme which is specially high-lighted by the sporty and dynamic aerodynamics package. 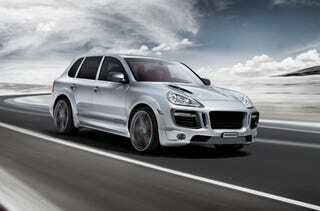 It plays the latest Cayenne outstandingly to the gallery and fits to all model versions. The complete new frontskirt/bumper impresses by its aggressive and distinctive visual appearance. Bigger air-intakes with fins as well as a front splitter with its own brake aeration award the Rinspeed X-treme a proprietary and typical look. Beefy wheel arches let the sporty SUV appear to be much wider and more dynamic. The side skirts fit elegantly into the existing side lines and connect homogenously the wide wheel arches. The rear skirt has received a difusor which diminishes the down force significantly. The two rear chrome exhaust tips are the high-light of the back end. The sporty exhaust system clearly suggests the ample power under the hood. The X-treme will bring up to 600 hp on the road. The contact to the road is ensures by the enormous wheel-tire-combination in the typical Rinspeed design. The biggest available version is of the size of 11x23 inches. The 315/25-23 tires are especially approved for speeds of the 300 km/h. The air suspension is customized with an electronic module which lowers the SUV by 35 mm - the whole range covers 110 mm .